Posted April 23, 2015 by NBYT	GIVE NBYT! When you donate $25, $50, $100 or more to NBYT now through May 31, you’ll be supporting the Young Actors Fund and can reserve yourself tickets to this summer’s The Wizard of Oz and receive other gifts too! Despite NBYT keeping costs as low as possible, some families in our area cannot afford participation fees, and they ask for full or partial financial assistance. We want to help when we can, but we need donations from our community to support doing that. The Young Actors Fund is our pool of donations that pays participation fees for families in need whose children want to be in an NBYT play or musical. 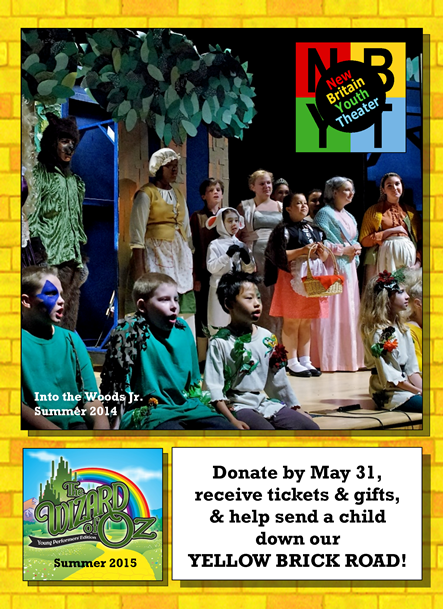 Now though May 31, donations will specifically support a child’s participation in this summer’s musical, The Wizard of Oz. Individuals, business, and organizations are all welcome as donors—and of course are even welcome to donate the full $375 for one child’s participation in our summer program. Donations may be mailed to New Britain Youth Theater, P.O. Box 306, New Britain, CT 06050-0306. Donations may also be made online through PayPal (even if you don’t have a PayPal account). New Britain Youth Theater is a 501(c)3 nonprofit organization, and all donations are tax-deductible to the full extent allowed by law. To contact us with any questions, please call 860-515-8115. The Wizard of Oz will be performed on July 24, 25 and 26. Registration is ongoing for children ages 7-16 to participate in the four-week, half-day program. Children ages 5-6 may also participate for one week and be in the production. Previous Previous post: STUART LITTLE Coming to NBYT! Next Next post: Spring Fling Fundraisers!